Junior Wilson – vocals, acoustic & electric guitars, banjo, fiddle , mandolin, steel guitar, keyboards & musical backing track programming. My life in music started at around 6 years old, first on the lap steel guitar and moving on to regular Spanish guitar, 5 string banjo, organ, mandolin, piano, pedal steel guitar and later fiddle and synthesizers. My parents both played music and I played in musical ensembles early on. Dad was a stringed instrument guy and a fine old time banjo player. He also played accordion, bones and the drum set. Mom played the Hammond Organ. There were always nice instruments around the house and we often listened to my parents big band and old Bob Wills western swing records and of course American Band Stand each day. My father had jam sessions with his friends often too. I started collecting records of great guitarists early on. I also liked listening to the fine guitarists Neil Levan and Buddy Merril featured on Lawrence Welk’s weekly show, which they usually had a spot playing their Fender guitars. Some of my early guitar heroes were Chet Atkins, Wes Montgomery, Merle Travis , The Ventures, all of the fine jazz players , western swing players, Joe Maphis and all of the blues guys like B.B King. And I was listening to many others on different instruments too. I was totally amazed by Earl Scrugg’s 5 string banjo playing on “The Beverly Hillbillies Show” theme. Hearing him play that tune actually changed my path in life and prompted me to take my music much more seriously. Practicing every spare moment I could I made a huge leap in a couple of years and proceeded to apply my newly acquired skills to other instruments I played, especially the guitar. By the mid 60s our music store was a place of regular jam sessions with all types of older players hanging out. I found myself playing lots of styles as a teen. Country, bluegrass, folk, jazz, all kinds of rock, blues & later psychedelic music. After high school I attended Wesley College in Dover for a year as a music major to learn more theory. In 1973 I went to New York to visit my friend Geoff Daking and record some of my original tunes. Geoff had played drums in the hit 60s psychedelic band “The Blues Magoos” & had since started a recording studio business on West 45th street in Manhattan. It was a great full tilt studio and I did some tracks there with friends Greg Ellingsworth and Bill Larsen, plus some NYC studio alumni. Geoff hooked me up with some quite well known studio players. A few months later I was introduced to a Stu Nunnery who I later performed with for about a year. We did a lot of memorable shows. Stu is now having a resurgence in his music. For much of the rest of the 70s I played in regional bands on Delmarva while operating our family’s music store. Around 1978 I started a recording studio business (Electric Possum Land) as well and recorded demos and records plus over 178 original radio /TV jingles. The 80s were spent with several popular bands such as “Tader & The Heartbeats”, “The Movies”, “Fun with Joan” and “The Cutters”. Our original studio based group “The Movies” recorded a single “Photograph” which got some national play as well. After some break ups a few years later “Fun With Joan” was formed. It was a synthesizer, midi and computer driven band. From that work I learned the use of midi and honed my arranging skills with making backing tracks. Forward to around 1997 when I decided to use my knowledge of midi synthesizer-computer technology again to create backing tracks for a solo one man band act. Instead of a minimalist lounge mentality which most followed I chose to make it more of a mini concert concept and fewer compromises. So to make it a bit more special and interesting I decided to play several other stringed instruments and live keyboard parts along with the backing tracks I had created. I also carried enough PA system in my van to smoothly do a large events & outside venues as well as small more intimate ones. The song list from the beginning was quite diverse too, covering many eras and genres of music. In 2013 Chatty (Chad Cooper) , an old friend of mine who had been working with me in our former band “The Movies” for several years, sat in with my solo act one night and it clicked. So now we perform as our duo regularly having a lot of fun with both the music and the audiences. Chad Cooper – Congas, bongos, various world percussion instruments, announcements & backing vocals. Chatty started his musical adventure in the mid 60s. I first met him in our family music store in Dover in the late 60s and he was already in a popular regional band known as “Shaky Jake” , who had recorded a 45. (I remember he looked uncannily like the famous drummer Buddy Miles back then). At a 60s era show in Wilmington, DE “Shaky Jake” shared the stage with both rock icons “Rare Earth” and “Cream”. Later he was in another fine psychedelic funk/rock band called “Scuzzy Frog”. After that he moved to Norfolk and played in “Polyphony”, who recorded a very impressive progressive rock album that was released nationally. A bit later he did some back up work with greats such as B.B.King before joining up with Bill Deal & The Rhondels in the early 70s. Bill Deal had a “Southern beach music” sound which incorporated a horn section. He also had quite a large fan base and some legit 45 hits. 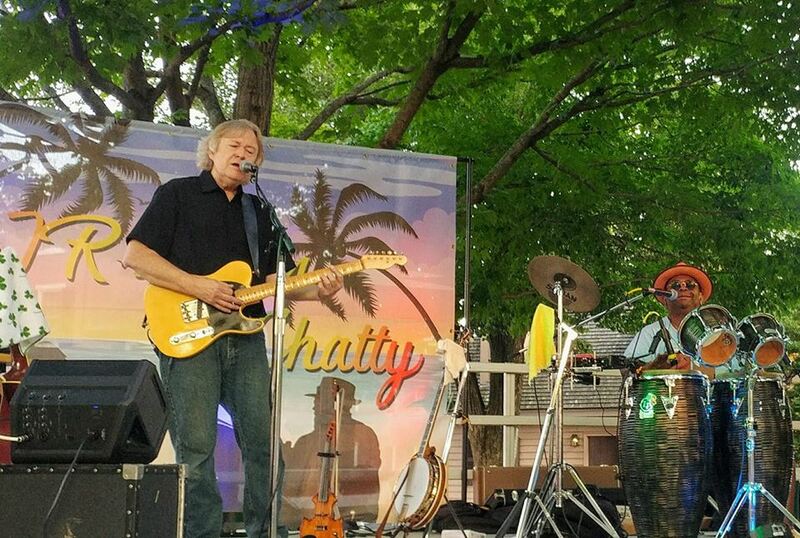 Chatty toured with the band for the next 5 years doing around 250 dates a year & playing quite a few TV shows . The Rhondels band also backed up other well known performers. After that experience wound down Chatty had a day career in the airlines in Washington for 20 years as a human resources manager, from which he has now retired. But in his time off from his day job he continued to perform. Around 2005 a group of Dover area musician friends formed a band called “The Draw” which played regularly in the Delmarva area. After that band ended in 2011 Chatty joined “The Movies” and performed with the band until it ended in July of 2015. In 2013 Chatty sat in with my solo act one night and it clicked. We have been doing gigs as the duo ever since. Visit Junior & Chatty’s website here.